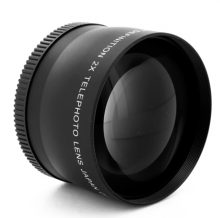 The 2X Professional Telephoto Conversion lens provides a tele-photo option for smartphone camera adapters with 37mm screw threads. When you wish to capture distant sceneries or objects, you will be able to pull in and magnify distant images by adding the conversion lens in front of your existing lens. Compatible with digital camera adapters and camcorders with 37mm size lens thread. Click the button below to add the 2X Telephoto Lens 37mm to your wish list.